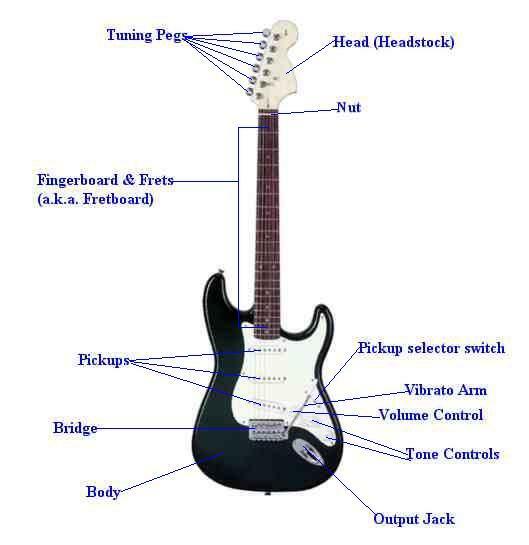 This page will provide you with information about this type of guitar, explaining the most common parts and how they work. Most electric guitars have 6 tuning pegs located on the same side of the headstock (some however have 3 on each side of the head). Turn the pegs to tune the guitar. Turning the pegs either tighten or loosen the strings resulting in a higher or lower pitched tone. The nut is designed to lead the strings from the fret board to the tuning pegs through the slots in the nut. It is usually made of plastic, brass, bone or graphite. Many guitarists prefer a nut made of bone as they claim it produces the best sound. In any case, if you use the vibrato arm a lot or play your guitar in a rough way, a nut made out of a low friction material would be preferred as it wouldn't cause your strings to "snap at the nut" so frequently. The guitar neck itself is most commonly made out of rosewood or maple or variations of those types of wood. Necks can also be made out of ebony or mahogany. Some players choose their guitar necks carefully as it is a factor in the overall sound of the guitar. The neck is either bolted to the guitar body or made as one part with the guitar body. The fret board on this guitar type consists of fret wires place into the guitar's neck. Between these wires are the frets where you place your fingers. A standard electric guitar usually has 21-24 frets. Each fret represents one semitone so a fret board with 24 frets is spanning 2 octaves (24 semitones). You can think of the pick ups as microphones on your electric guitar. Most electric guitars have 2-3 pickups and their placement is important. Located close to the neck the pickup will produce a soft rounded sound, while located close to the bridge it will produce a sharper, more pointy sound. When speaking of electric guitars and pickups we are usually talking about magnetic pickups, as they use magnets to convert the vibration of the string into an electric signal, and these can be divided into 2 main types: The Humbucker (Double-coil) and the single coil pickup. Double-coil pickups are basically single coil pickups mounted side by side and the sound they pick up is "integrated" through to the output. Experimenting with pickup placement on the guitar can produce some interesting variations in the sound. The pickup selector switch toggles between the pickups (or combination of pickups) the guitar uses to pick up the sound. The picture above displays single coil pickups. The bridge can be divided into 2 main types: Tremolo and non-tremolo (hard tail) bridges. The tremolo bridge has an extension arm (a.k.a. vibrato arm) which the player can push (and in some cases pull) to decrease or increase the string tension causing a tremolo or vibrato effect in the sound. The guitar body is commonly made of maple, mahogany or ash wood and comes in a wide variety of shapes and sizes. The choice of wood here will also be a contributing factor to the overall sound of the guitar. The white part of the guitar body in the picture above is the pick guard. It is there to protect the wood finish of the guitar body from being struck or scraped by the pick when picking the strings. The volume control adjusts the volume (big surprise!! ;-)) on the signal picked up by the pickups. The tone controls adjusts the treble on the sound. There are usually 2 or more tone controls each referring to the pickup selected with the pickup selector switch. A cable with a 1/4" male jack plug in both ends is used to plug the guitar into an amplifier or a mixing unit.